Right from the start of their relationship, Eric Charles-Gallo and Louis Gallo of Kansas City, Missouri, knew they wanted to be dads. “We only wanted one kiddo at first, and thought we’d be lucky to have one,” Eric tells Yahoo Parenting. He says it with a chuckle because now, nearly a decade later, the two men have adopted six kids between the ages of 4 and 12 — many with significant medical issues — and fostered about 30. They’re still not done giving back, either. The couple is now in the process of adopting yet another foster child, 16-year-old Darnell. 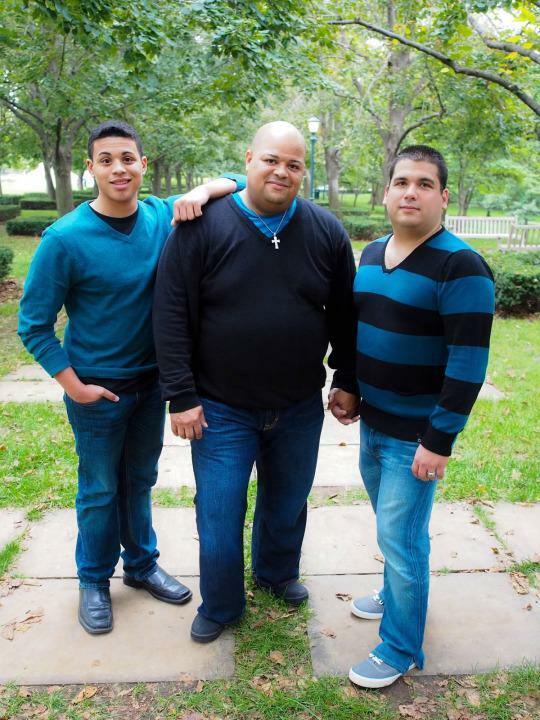 And while the teen doesn’t have any of the health challenges faced by his soon-to-be siblings, he is struggling with an issue that his new dads are uniquely qualified to support him through: being gay. It was a stark difference from the atmosphere Darnell was experiencing at home in small-town Missouri with his biological family — where a combination of homophobic rejection and an abusive relationship between his parents sent him running away one cold winter evening earlier this year. Eric and Darnell realized quickly that they were kindred spirits — Eric had been an avid cheerleader as a teen, they have similar personalities, and both are biracial. In fact, Eric explains, it was that latter quality that was his personal struggle as a teen, more so than realizing he was gay. “I come from a neighborhood where you’re either white or you’re black,” he says. “So that’s how I was different.” He came out at 21 and Louis came out at 19, he adds, and both men are lucky to have very supportive families. And now they’re able to provide that for Darnell, while also showing him, through example, how possible it is to lead a proud, full life.